Cold shrimp is simple to prepare and a small serving packs a lot of protein into your meal. According to LIVESTRONG.COM MyPlate, a 4-oz. serving of shrimp yields 80 calories, 1 g of fat and 18 g of protein. Shrimp is high in cholesterol, however, with one serving containing 55 percent of the daily recommended allowance. Buy pre-cooked and chilled shrimp at your local fishmonger or grocery store, or cook your own shrimp and refrigerate overnight. Rinse shelled shrimp in cold water. Peel the shells off the cold shrimp. This step is optional — you can leave the shells according to your presentation preference. Another option is to take off the shell but leave the tail on. Always remove the shell and tail before eating. Remove the vein running through the midline of the body with a sharp knife. This step is also optional, since shrimp can be eaten with the vein intact. 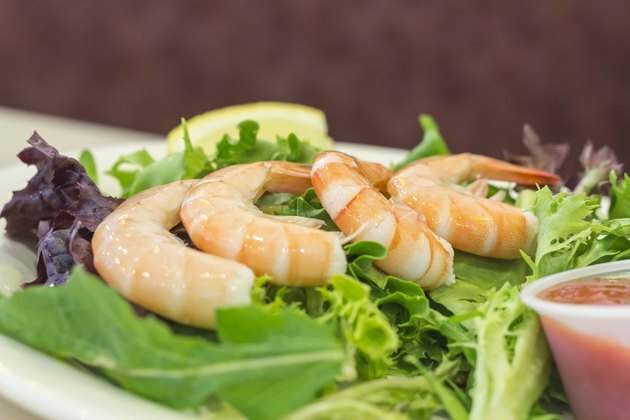 Arrange cold shrimp around a goblet or dish or on a bed of iceberg lettuce leaves. For shrimp cocktail, it is customary to remove all of the shell with the exception of the tail. Hang the shrimp over the side of the container with the tail side facing out. Make cocktail sauce for dipping by combining ketchup with horseradish. Because horseradish is spicy, add it in small amounts until the sauce has reached your desired taste. Serve the shrimp cocktail with cut lemon wedges and an extra bowl to collect the tails. Peel the shrimp fully and remove the vein. Boil pasta and drain well. You may refrigerate the pasta for a few hours to serve the salad cold. Chop up onion, garlic, green peppers and any other vegetables you would like to add to the salad. Prepare a dressing for the pasta salad. A popular choice is mayonnaise and sour cream. Try low-fat salad dressing such as ranch, Italian or an Asian-inspired sesame ginger dressing for a reduced-calorie option. Add shrimp and vegetables to the pasta. Cover the salad with the dressing of your choice and mix well. Refrigerate before serving. You can eat cold shrimp plain without any dressing for a low-fat snack. Eating raw or under-cooked seafood increases your risk of contracting a food-borne illness. How Do I Thaw & Serve Frozen Cooked Shrimp?